Born October 10, 1987 to Josky and Vance, both wild caught in Southeast Asia as calves, all three were the property of the now-deceased elephant trainer and circus performer, Roman Schmitt. At the time of Ned’s birth, Mr. Schmitt was the manager of the Busch Gardens’ elephant breeding program. Ned was surgically castrated in his youth. At the tender age of two, Ned was sold to a circus elephant trainer named Buckles Woodcock and made his performing debut in 1990 with the Big Apple Circus. Reportedly, Ned continued to perform on the show for nearly a decade until the Big Apple Circus removed elephants from their line-up. Sometime later, Mr. Woodcock transferred ownership of Ned to Lance Ramos, a fellow circus trainer and performer in Florida. It was reported that Lance Ramos and Ned were seen performing with the Royal Hannaford traveling circus. Unfortunately for Ned, his health and weight had been severely compromised. Photos of a severely emaciated Ned surfaced that eventually sparked another United States Department of Agriculture investigation. As far back as 2000, the United States Department of Agriculture was monitoring the activities of Lance Ramos and his Oscarian Brothers Circus. Records indicate that in June of 2000 the USDA charged the circus with violating the Animal Welfare Act for failing to contain an elephant by failing to provide and maintain an enclosure of sufficient strength, which resulted in the elephant attacking and killing a woman. This same 18-year-old female African elephant named Kenya was later found dead, eleven days following the fatal attack. According to Sgt. Rod Reder, a spokesman for the Hillsborough County Sheriff's Office “Possible foul play is suspected in the death of this elephant." The cause of Kenya’s death was never determined. On November 8, 2008, the United States Department of Agriculture confiscated Ned, an adult male Asian elephant. Allegedly, owner Lance Ramos, a resident of Florida, failed to comply with the Animal Welfare Act and under the USDA’s authority Ned was placed with The Elephant Sanctuary in Tennessee becoming the 24th resident. Ned was the second rescue to be placed with The Sanctuary (Delhi was the first). Ned’s stay was intended to be only temporary until he recovered and could make a cross-country move to a permanent facility. 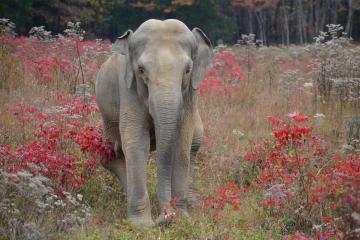 Ned was seriously underweight; The Sanctuary’s focus over the next weeks was on Ned’s recovery. In the months that followed, Ned’s health did not improve despite countless tests, expert veterinary consultations and changes in diet. He did not put on any measurable weight and seemed to experience chronic abdominal pain. Ned did show behaviors of starting to overcome many fears and shyness. He played with toys and even dogs on a few occasions, and he sampled spring grasses and low lying branches in his habitat as he exercised his freedom to explore on his own terms, making the most out of each day. On May 15, 2009, after only 6 months of Sanctuary, Ned passed away. It was later learned he suffered from a multitude of digestive problems, including extensive, irreversible ulcers and scarring throughout his intestinal tract –believed to have been caused by years of stress.